The House with the Green Shutters is a mordant, witty, frequently upsetting, lonely work. George Douglas Brown was to die shortly after its publication and we can only guess whether it would have been a solitary success or the predecessor of a string of such works. It is a realistic tale of a village not very dissimilar to Brown’s native Ochiltree (despite his strenuous denials after the event) populated, not with the sugary characters of the kailyard, but with ‘nesty’ Scotsmen: mean, inquisitive, grudging, and actively conspiring to ruin the main character, Jock Gourlay. Crude, powerful, admirable but ultimately repellent, this local carrier, self-made and proud of it, brutally domineers his family. He crushes his wife and daughter and unmans his weakling son who, in a parody of the all-too-familiar kailyard progression, ruins himself through drink at university and creeps home disgraced. Ultimately, he commits suicide after murdering his father, and on finding his body, his mother and sister also poison themselves. The end of the novel is bleak indeed; the new house (symbol of its builder’s success) empty and desolate. Marred as it is by errors of over-emphasis and a desire to compensate for the unthinking nostalgia of so much kailyard, The House with the Green Shutters is the testament of a young man who grew up in bitter poverty, the stigma of his illegitimacy never far from his mind, who worked his way, through ability and hard study, to Ayr Academy, to Glasgow and to Oxford. In the kailyard, he would have risen to the highest honours; in real life, after interrupting his studies to nurse his dying mother through cancer, Brown took a poor degree, wrote much journalism, some fiction and this superb ‘apologia’, and died. 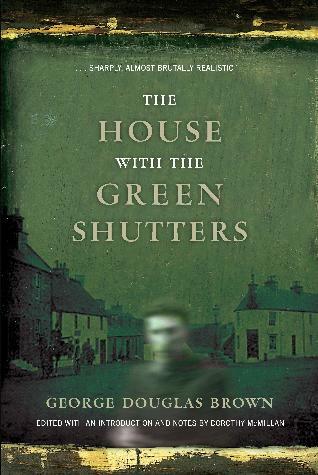 The printing history of The House with the Green Shutters is a really interesting one. Published simultaneously in 1901 by John Macqueen, London, and McClure Phillips, New York, there were sales in the first year of 10-20,000. The first eight UK and two US impressions used the original Edinburgh typesetting. The New York issues, bound to a separate size without text signatures, and contained independently commissioned advertisements. Macqueen apparently either retained standing type or employed some form of stereotyping, since the same typesetting, misprints, type-batter and all, was available for the scarce 1905 paperback issue (with a truly appalling new title page and an illustrated cover) from George Morton of 42 George Street, Edinburgh. Perhaps most interesting of all was the discovery of a proof copy in Glasgow with Brown’s own corrections and notes indicating his intentions for a possible re-issue – one he was not to live to complete – which leaves us an outline of a softened and humanised plot. This unique proof, composed of the US text (printed first) and the UK title page, suggests the normal rush of pre-publication and printing to get review copies out in time: lacking its final brown paper cover – as tantalising a glimpse into the author’s mind as the tinkerings he made in his other texts including the presentation copy of the US edition to his fiancée. Second thoughts and even third thoughts were part of his method. It was left to his friends and associates to keep the book in print – but the book as he left it, angry imperfections and all. Though kailyard fiction is largely relegated to specialist interest (if not, alas, some of the attitudes it enshrines) this counterblast has somehow acquired an interest wider than its original target: while The House is content to parody the form, content, plot and characters of the popular kailyarders, in order to capture attention, it acquires a momentum of its own. The sales of a handsome 6/- hardback from an almost unknown writer, published outside Scotland in the face of kailyard popularity, are a tribute to the power of the book – ‘disagreeable’ power, as one contemporary reviewer called it. My row of subtly different copies of the early impressions shows the evolution of what could have been a bestseller, but what was instead cut short by Brown’s death into a notable first novel. To see the text altered and adjusted between issues, particularly when transferred to the inexpensive paperback formula of 1905, is the great pleasure of owning a run of these early sets.